Custom rate card integration - There's no need to comply with another standardized rate card or system, we make your rate card work as-is. Automatic PDF License and Invoice generation - We dynamically assemble your invoice based on the type of use selected by the client, their contact info, and the price for the license, and we make it available to both the licensor and licensee immediately. Full E-Commerce Support - Take payment on the spot through the most secure credit card payment transaction system available today. That's right, you can accept all major credit cards immediately and there's no need for you to go set up your own merchant account or payment gateways - that's all handled and ready to go. The "Make an Offer" system - This super straightforward system allows your clients to make an offer for a license if they feel like their type of use might not fit directly into your rate card. Once an offer is made you get an email that notifies you of the offer and at that point you can accept, reject, or counter offer. When both parties agree on the terms the licensor gets sent straight into the payment page so they can finish up the transaction and pay the agreed upon amount. Sending a License Proposal - We know that not all licenses will be hand-picked and built by clients who are searching your site. In the case that you want to select the track, type of use & price, and send it to your client for review & payment, we have that covered too. 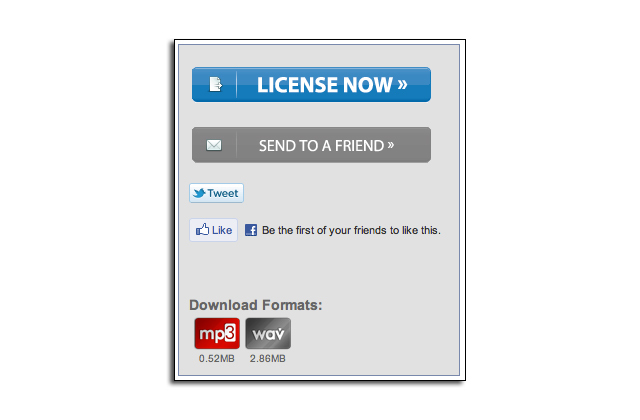 Look for the "Send License Proposal" button on the first page of the "License Now" flow (see complete tutorial below). 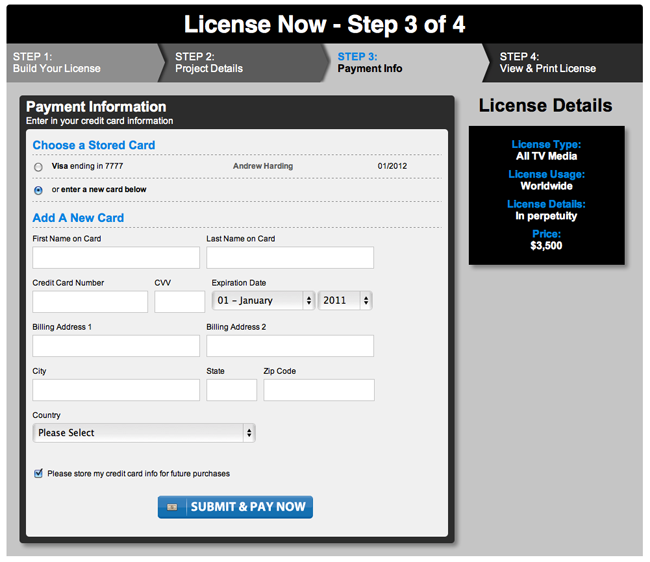 You can assemble the license in 10 seconds or less and send it to your client for immediate payment. License History and Reporting - We also know keeping a record of all licenses performed is key. That's why we built the "License History" tab in your Dashboard. In this new section you can track all license transactions along with their price, the date of the transaction, the licensor's info, and you will have quick access to both the license and invoice PDF's. 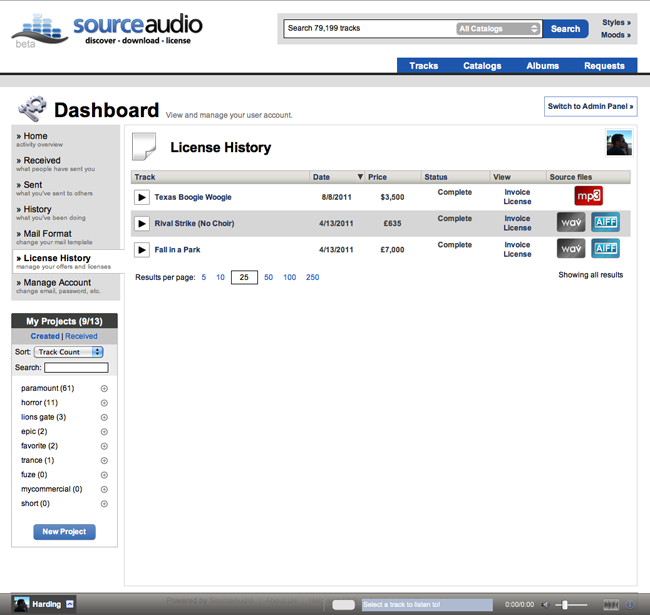 A complete history of your licensing business will be stored nicely in one location, accessible to you from anywhere. Now let's take a look at how this powerful new feature works. 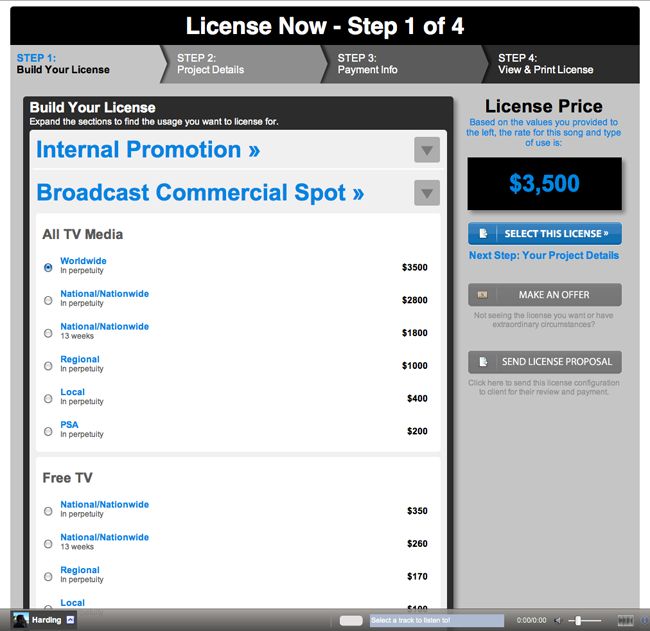 The licensing flow is nicely broken out into a step-by-step process that is simple for anyone to use. During the first step your users will be able to look through your full rate card and make the selection for their specific type of use. Once they've made their selection the price will show up on the right side of the page and they can proceed to the next step. Here is where your client provides you with their contact info and the details about their project. This step is very cool because once the form is completed the user can preview both the pending license and pending invoice for this transaction before they proceed. We assemble the PDF in real time so your client can review and feel comfortable about proceeding with their selections. What is also great about this step is the fact that once a licensor has provided their contact information we store it in the system so they don't have to fill out the same form each time they license a cue from you. This step comes pre-populated so they can proceed quickly. Here is where the licensor provides their credit card information for this transaction. We provide a secure, 3rd party service that allows us to store credit card information for each user in order to make their future purchasing efforts as easy as possible too. After their first purchase they will be able to come back and license more tracks without having to input their card information each time. Upon clicking "Submit and Pay Now" we contact the credit card authorization network and obtain immediate approval for the card and transaction. 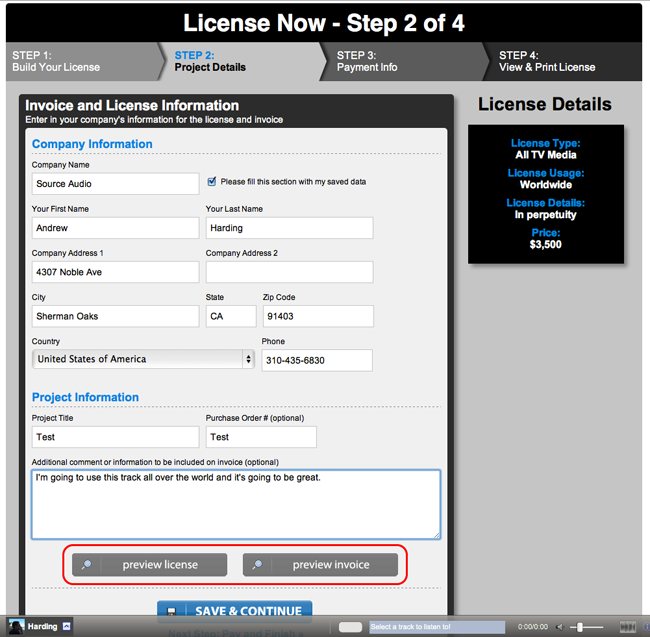 This confirmation screen gives the licensor quick access to both PDF's generated during the transaction - the invoice and license. From here they can print or email both documents. Copies of these docs have been stored in both the licensor's and licensee's "License History" section of the Dashboard as well. Here's a quick look at the License History section of your Dashboard that was mentioned above. As you can see it provides a complete list of licenses performed through the site along with quick access to the license and invoice. The last thing to mention here is the email notification system built into the licensing tool. For every offer, counter-offer, and license transaction performed through the site you will get a handy email notification. Below is an example of what a new license transaction email notification looks like. 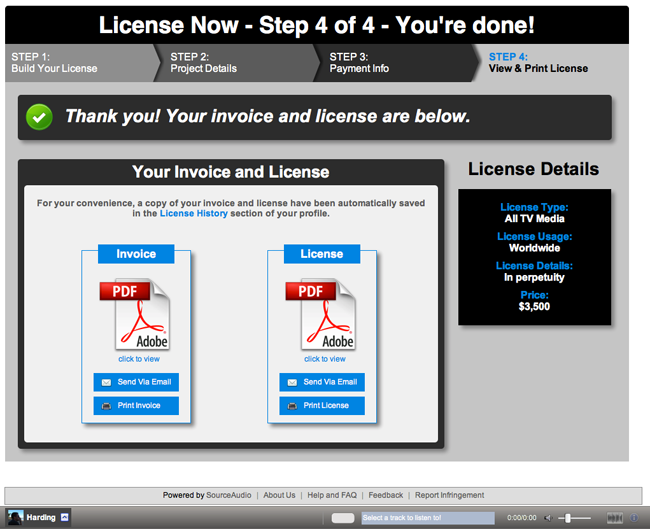 Notice that the invoice and license PDF's are attached to the email for quick and easy access. And that's it! We kept it simple but it's extremely powerful. Contact us now for more details on how to get set up with online licensing for your business. We're happy to take anyone through a complete end-to-end demo if they're interested as well. Just let us know a time that works well for you and we'll make it happen. More great stuff to come soon!